Description: Stunning outside & in! Truly a beautiful home, boasting upgrades seldom found at this price! Exterior brick front w/architectural interest, concrete-composit siding/3 sides! Kitchen is chef's dream w/upgraded cabs/gorgeous island, granite & ss appliances! 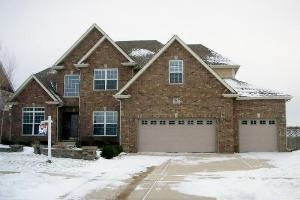 Custom home is warm, w/spacious, open layout! Fam rm is a big 23x18-wide open to great kitchen! Master suite w/sitting rm! Jacknjill+priv bath! Bmt is plumbed! Wow!